MONOGHOST – LUCKY BAG DISCOVERY! Trust Pigs over at SPANKYSTOKES.COM did a great write up about the discovery of MONOGHOST – a brand new figure from Brian Flynn which debuted in the 2013 Lucky Bags! I was extremely lucky and happened to get an unpainted sample of my own (below right)! 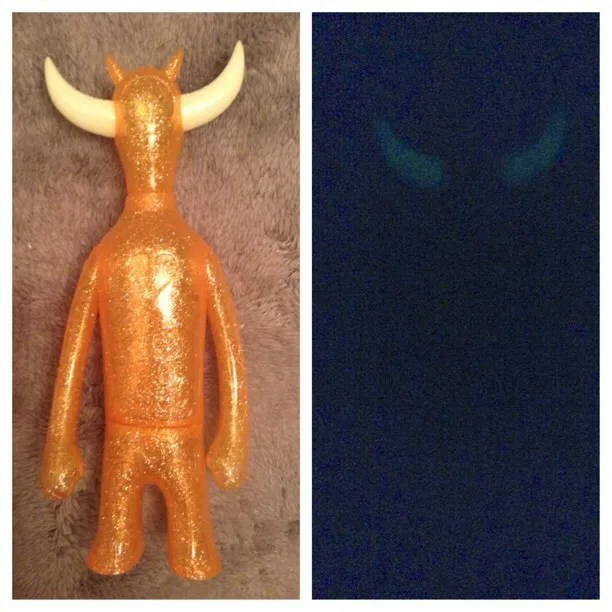 Standing just shy of 10-inches tall, the majority of the figure uses the Visighost cast (legs, upper body, and arms) but the head is a completely new sculpt… from the singular large eye to the four horns cast into the head (two in the front, two in the back) to the pair of large horns affixed to the side of the head… and on the copy I received, these separate horns happen to glow-in-the-dark as well. What will you find in your Super7 Lucky Bag?